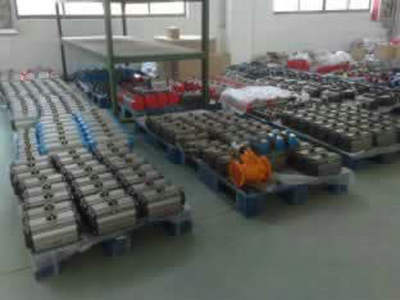 Product categories of Pneumatic Actuator, we are specialized manufacturers from China, Pneumatic Actuator, Double Acting Pneumatic Valve Actuator suppliers/factory, wholesale high-quality products of Pneumatic Valve Actuator R & D and manufacturing, we have the perfect after-sales service and technical support. Look forward to your cooperation! ● Extruded aluminum ASTM6005 body with bath internal and external corrosion protection having honed cylinder surface for longer life and low coefficient of friction. ● Dual piston rack and pinion design for compact construction, symmetric mounting position, high-cycle fife and fast operation, reverse rotation can be accomplished in the field by simply inverting the pistons. ● Multiple bearings and guides on racks and pistons, low friction, high cycle life and prevent shaft blowout. ● Modular preloaded spring cartridge design, with coated spring for simple versatile range, greater safely and corrosion resistance, longer cycle life. ● Full conformance to the latest specifications: IS05211, DIN 3337 and Namur or product inter changeability and easy mounting of solenoids, limit switches and other aocessodes.